Acquired a Bosch BME280 for improved humidity, air pressure and temperature-measurement (DHT22 can’t read barometric pressure) and tried to attach it via I2C. Integrated then at least via analog reading the YL-69 moisture sensor. Worked well and on first try. Guess I just need to read much, much .. more about I2C, wiring and the sensors. Code is committed and pushed to github. 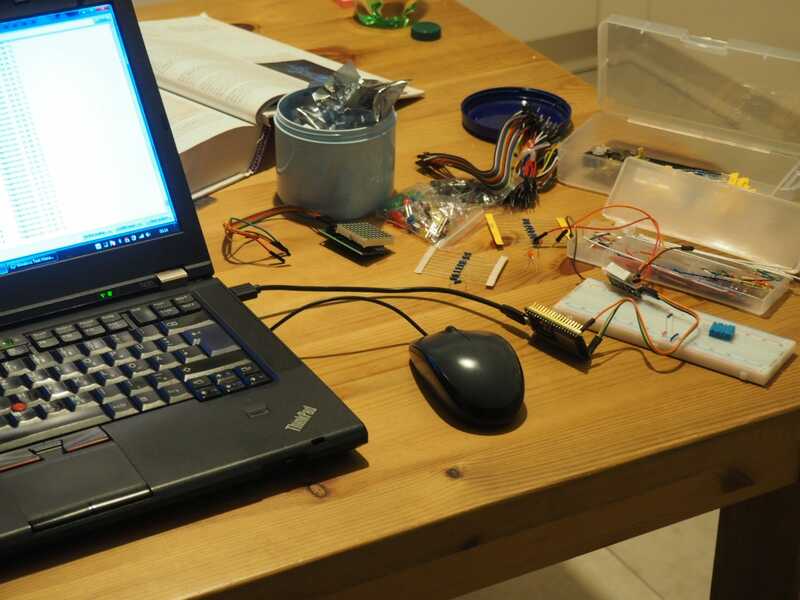 To give my (non-existant) skills for microcontrollers and reading out sensor-values a kick-start, I decided to connect today an DHT11 to the ESP32. 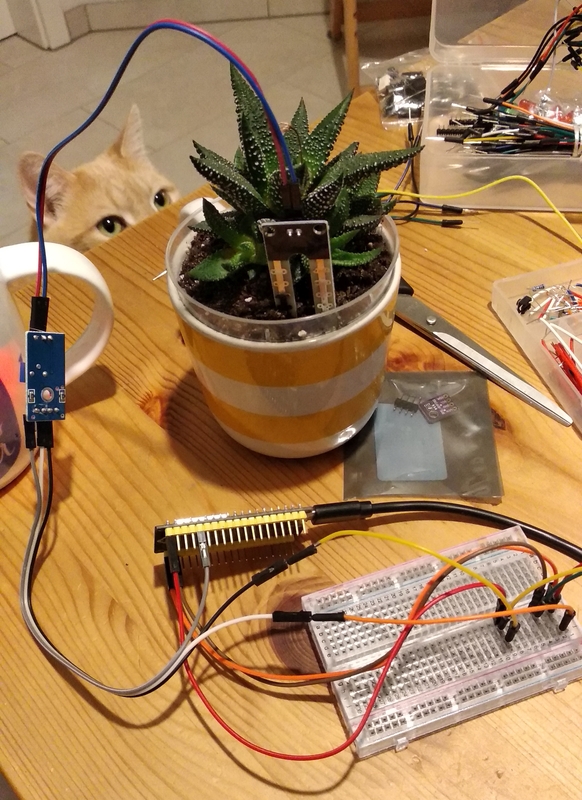 So, at first I realized I have no clue how a breadboard works, then that I need a calculator to determine the resistors properly, then “how to determine the correct pin-numbering”, then … it did not work, no matter what I tried. 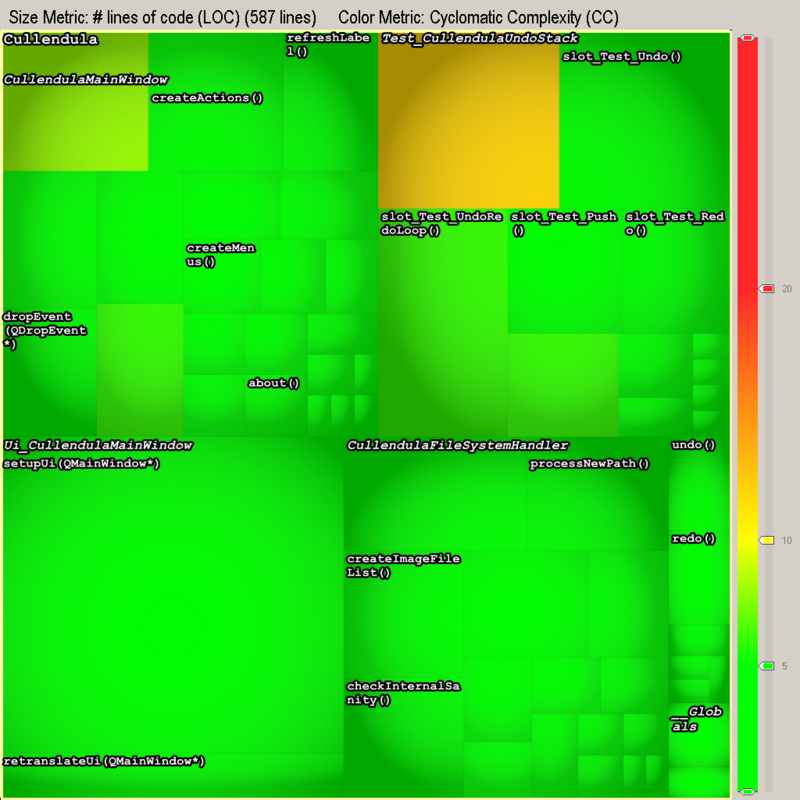 The C++-code was the least issue. Several sources provide examples, also with webserver (looks like everyone ~stole~ got inspired from each other ..), but the read-out always failed. Luckily I had two (a bit more ‘expensive) DHT22 at hand and it worked like a charm! Find all fitting files and run the fixer-script in parallel over it. After playing for a while with sed and awk and not being able to get a fitting solution, I decided to create my own as python-script. It squashes all consecutive double-whitespace-lines (and adds one to the end if missing). Qt (or Digia? or how was the company-owning-Qt called at that time?) 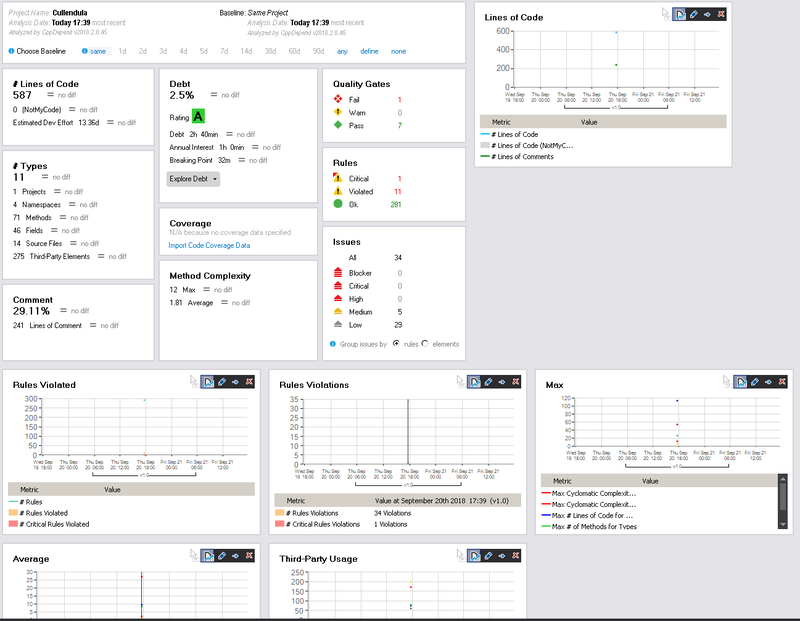 released in 2014 the version 1.4 of their Charts add-on for Qt. It was available only for the commercial-license and had some distinc namespace-requirements. And was also quite bare-metal. Further development lead to more opportunities regarding the emitted signals for the cursor-handling (pressed/released instead of just clicked, for instance) and it became part of the regular package for Qt. Et voilà , it should build now. The first month of 2019 already passed. And we passed it with flying colors! 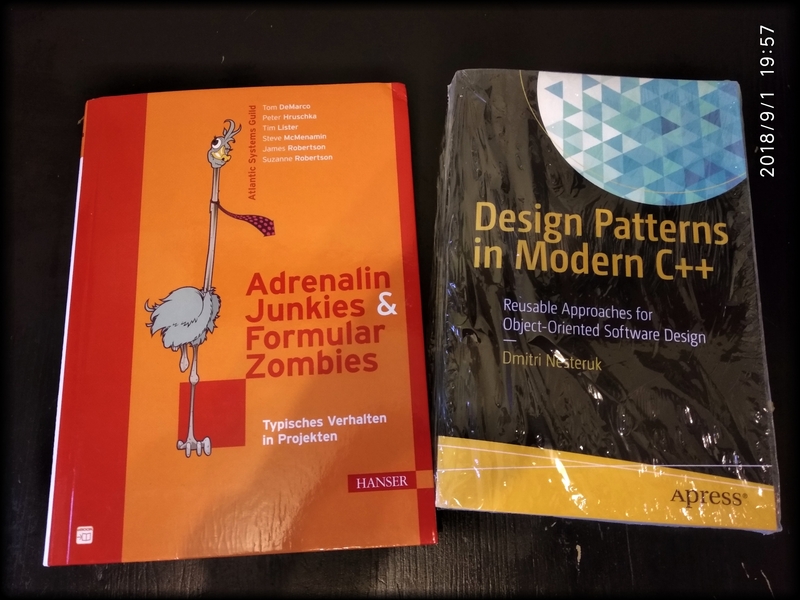 But let’s have a look at 2018 – a year full of challenges and success: I’ve worked full-time, organized and participated in advanced courses for Python and in Requirements Engineering (officially: IREB Requirements Engineering Foundation Level-approved) and pursued a new employment as software engineer. And I wrote some software in my spare-time, as you can see in the graph for the public github-repositories. 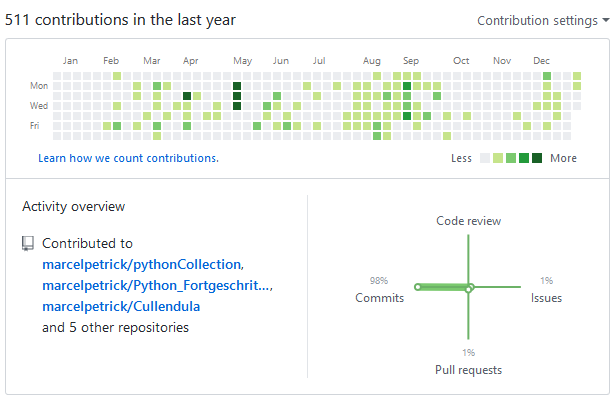 The gaps in the commits can be explained with the birth of my daughter and the time where I acquired the new job and moved nearly 900 km across the country. Yay! Nice personal projects were and are Cullendula and the Daily Coding Challenges, which I solve mostly with fully Unit-tested Python (3). More new, hands-on knowledge was gained in the area of CMake and Qt-charts. As every one knows: I am a fan of objective measurements in the quality and quantity of code. Another nice statistics-generator for such a task is: cppdepend (trial is free for the first month). It can detect some mistakes and deviations from common coding guidelines (like MISRA) and supports your judgment with some figures. But what if I want to use the type-safe Qt5-connects? * and (for example) using the above-mentioned way of the string-based connect. Ok, cmake 2.8 was installed – I need 3.0. At least. For C++11 features. Had first an interesting discussion if you can call the “patterns” we use patterns. Or if there are no “patterns” in software-development, just “idioms”. Of course, quite academical question. But it reminded me to remove the dust & spider-webs from my own knowledge and refresh it a bit. What’s better than doing it with some C++17 – support? The other book was just referenced in some software architecture-book. Interesting collection of anecdotes. I can confirm half of the given examples as “seen in real life and projects” ..